The Grundig G3 is one of my favorite portable shortwave receivers. 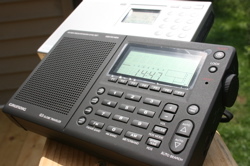 The G3 features AM/FM/Shortwave Radio with Aircraft Band, SSB (Single-Side Band), RDS (Radio Data System) and a Synchronous Detector. I have reviewed it thoroughly on the SWLing Post–please note the comment thread where I posted updates over time. This entry was posted in Grundig, Portables and tagged G3, Grundig, Grundig G3. Bookmark the permalink.